UK: Why when Ukip speaks about women’s issues do they end up trolling them? Cameron faces an exodus of women MPs. Jessica Lee MP is fourth 2010 Tory woman to quit Telegraph.co.uk Jessica Lee, a Commons aide to Dominic Grieve, the Attorney General, said she was stepping down from Parliament after considering her “personal circumstances and responsibilities”. Cameron faces an exodus of women MPs Politics.co.uk …With Lee gone, 11% of newly elected female MPs have announced their intention to stand down. Meanwhile, David Cameron is understood to be frustrated at resistance from local Tory associations to pick female candidates for the 2015 election. Lee was a barrister specialising in child protection and adoption cases but she became a Commons aide to attorney general Dominic Grieve in parliament. Just 16% of Tory MPs are women, compared to 31% of Labour. The Liberal Democrat figure is even worse, standing at just 12%. Lord Rennard: the story so far Telegraph.co.uk Lord Rennard, 53, was involved in the running of the party since 1989, when he was made director of campaigns and elections. He oversaw the party’s general election 2001 and 2005 campaigns, and was the Liberal Democrats’ chief executive from 2003 to 2009, when he quit for “family and health reasons”. Claims that he sexually harassed female party workers first emerged last February with several LibDem women telling Channel 4 News that Lord Rennard had touched them inappropriately or propositioned them. Bridget Harris, a former special adviser to Mr Clegg, said that in a hotel bar at a party conference, the peer repeatedly touched her legs without permission. Lib Dems at war after Lord Rennard attacks Nick Clegg’lynch mob’ Telegraph.co.uk Civil war has broken out in the Liberal Democrats after Lord Rennard turned his guns on the party’s leadership over its handling of the sexual harassment claims against him. The peer released a 2,600-word statement in which he refused to apologise to the women who made claims against him. He also attacked Nick Clegg, the Deputy Prime Minister, and the Lib Dems for helping to create a “lynch mob mentality” against him which forced him and his wife “into hiding”. In an attempt to stop an embarrassing challenge to Nick Clegg’s authority, the Lib Dems suspended the peer to prevent him taking his seat on the Government benches in the House of Lords. Rennard row: women claim intimidation The Guardian Women who allege they were harassed by the former Lib Dem chief executive Lord Rennard have accused his supporters of spreading smears against them. In an escalation of the row that threatens to split the party, Alison Smith, a politics lecturer and activist, suggested on Twitter that there was a personal campaign against the women who had made complaints against the peer. Another complainant, who did not want to be identified, said she felt intimidated by claims from Lord Carlile, Rennard’s legal adviser, that he had a devastating item of contradictory evidence against one of the accusers. “I don’t like the veiled threats that they are going to expose our personal lives,” she told the Guardian. Rennard: as Lib Dems squirm it’s good news for Labour The Week UK LABOUR’S top two women – deputy leader Harriet Harman and shadow home secretary Yvette Cooper – showed no compunction yesterday about intruding into Lib Dem grief over the alleged sexist behaviour of Lord Rennard. They were no doubt motivated by their long-standing and passionate commitment to promoting the role of women and fighting sexism at Westminster. But they will also have been aware that anything that damages Nick Clegg is likely to be a political bonus for Labour. Nigel Farage: women must sacrifice family life to succeed in finance The Guardian Nigel Farage provoked controversy yesterday by claiming that women who take time off work to have children are “worth less” to City employers than men. The Ukip leader made the comments during a speech in the City, arguing that women are able to do as well – if not better – than men but only if they are prepared to sacrifice family life. Farage argued there is no longer discrimination against women in financial institutions and suggested gender imbalances are caused by female employees making “different choices” for “biological reasons”. Nigel Farage, why is it everytime Ukip speaks aboutwomen, they … Telegraph.co.uk Why is it when anybody from Ukip speaks about women’s issues they end up trolling them in the process? Rather than address the prejudice and discrimination against mothers in the City, Farage has a) pretended it doesn’t exist and b) implied it is women’s fault: if they gave up spending so much time looking after their children they’d be alright and enjoy the same opportunities as men. Is this really the sort of world he wants for his two daughters, Victoria and Isabelle? OK, his comments may not appear to be as outrageous as the many outrageous comments we’ve heard from the Ukip corner recently. Bongo Bongo land and sluts. The ‘disaster’ of gay marriage. Farage dealt with Godfrey Bloom. He is dealing with David Silvester. But if he’s serious about reconnecting with women voters and the British public, he’s got to watch his own mouth, too. State enterprise sector shows the way for gender balance Irish Times The glass ceiling that holds women back from managerial advancement is as impenetrable as ever, with new research matching data from a decade ago. Everyone accepts that women make excellent rank and file workers but too few of them go on to become managers and leaders in their workplaces. It is as true for politics as for academia with women tending to hold fewer than one in five of the senior posts. The reasons why this is so have been debated for many decades, and from time to time efforts are made to correct this gross gender imbalance that the European Parliamentconsiders an infringement of human rights. 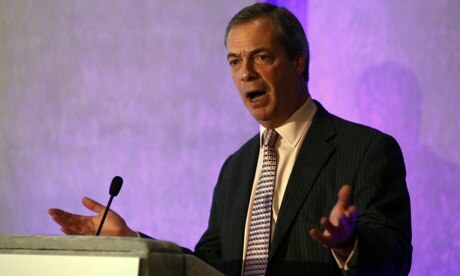 Previous postUK: Mothers are ‘worth less’ to employers in the City than men, says Nigel Farage. Parity democracy for Europe.